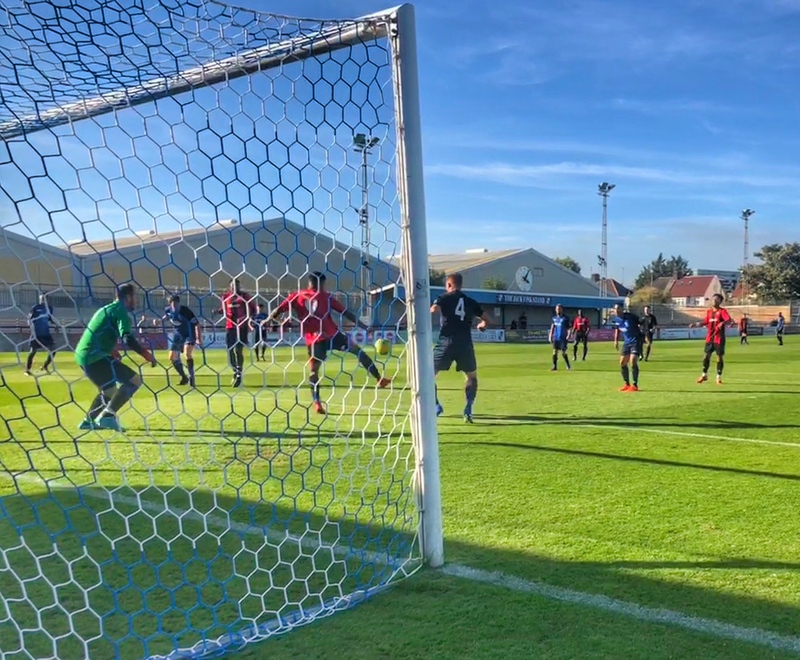 A second-half goal from James Hammond saw Lewes record an impressive 1-0 victory at Wingate & Finchley and move to within one point of the play-off places in the early-season Bostik Premier table, reports Tom Harper. Darren Freeman included three new signings in his squad, with Thomas Day starting at centre-back alongside Frankie Chappell, and Wilson Chingoka and Ramone Cassidy-Sinclair named on the bench. The first half saw next to no goalmouth action for either side, with the game mainly played in midfield on a warm afternoon in North London. The half-chances that were created tended to be from distance, as Lewis Carey comfortably held a long-range strike from Tommy Tejan-Sie, before Omarr Lawson saw an effort from a similar distance helped over the bar by Shane Gore at the other end. The closest either team came to breaking the deadlock before half-time saw Samor Bihmoutine fire just wide from the edge of the area. After a fairly drab first half, Lewes made a bright start to the second, with Gore forced into smart saves to deny Lawson and Jonte Smith in quick succession within minutes of the restart. The Rooks came even closer to taking the lead soon after, as a Steve Brinkhurst cross from the right picked out Smith at the far post, and his initial effort from a difficult angle came back off the upright and hit him in the face before bouncing just wide. Lewes were continuing to dominate, and Gore was called into action again to save a Nico Cotton strike with his feet at the end of an excellent passing move. The Rooks finally scored the goal their second-half display had deserved after 58 minutes through James Hammond, who met a Leon Redwood cross from the left with a looping header which went over Gore and into the back of the net. Lewes came close to doubling their lead just after the hour, as Dan Darbyshire broke free down the left, cut inside and shot just wide of the far post. The hosts were finding it difficult to get back into the game, with Chappell and Day superbly marshalling the Lewes back four. Wingate did begin to look more dangerous heading into the final 15 minutes though, and saw Carey react superbly to claw a close-range effort that seemed destined for the top corner behind after an Ola Williams cross had been forced goalwards. Their final chance to equalise came deep into stoppage time, but Marc Weatherstone could only shoot straight at Carey from close range after the Rooks had been unable to clear a free-kick. Lewes saw out the remaining minutes comfortably to record an impressive victory to move up to eighth in the table. Next up for the Rooks is a Sussex derby when they welcome Worthing to the Pan on Wednesday, kick-off at 7.45pm. Wingate & Finchley: Gore, Williams, Hernandez, Weatherstone, Cronin, Shulton, Putman (Laney 53), Bihmoutine (McKenna 52), Charles-Smith, Beckles-Richards, Tejan-Sie (Monsheju 71). Lewes: Carey, Brinkhurst, Redwood, Dome-Bemwin, Chappell, Day, Lawson, Hammond, Smith, Darbyshire (Cassidy-Sinclair 66), N. Cotton (Chingoka 80). Unused Subs: Conlon, Gifford, L. Cotton.